Andy Cecere ’82, CEO of U.S. Bancorp, spoke at St. Thomas’ First Friday in November 2016 and highlighted how central the role of innovation is in the future of banking. It’s perhaps no surprise, then, the company has created an innovation team, dedicated to shaping the company’s future as it explores and implements technological advances. Baked into that process is a recipe of creativity, curiosity and ethics, all within the framework of a 72,000-employee finance company. 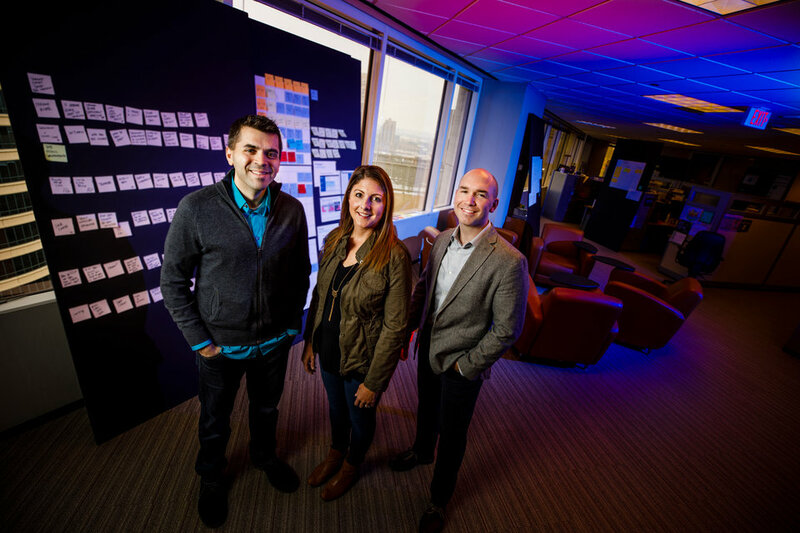 For three members of the innovation team – David Berglund, Kristin Hough Frame and David Marrese – their development for being part of that future-shaping process shares a common thread: their time in the MBA program at the University of St. Thomas. Each of the trio made their way to St. Thomas with the hopes of building their business acumen as they advanced in finance. At St. Thomas they found not only the value of developing those business language and skills, but how to apply it directly to their budding careers. Working through those kinds of problems in a small-group setting – similar to the team she’s now on – was critical for Hough Frame ’12 MBA. “The reason I chose St. Thomas was I wanted that small-group setting that I didn’t get [with my undergraduate degree]. … It helped in learning how to be open-minded and seeing that strategic view, which helps with the innovation team, to see the long-term goals,” she said. The development of a peer network through that process has continued to pay big dividends, Berglund said, and the program’s emphasis on developing strong ethics has proven critical as her team deals with developing what the future of banking for U.S. Bank and its customers could look like. In considering those kinds of complex scenarios, Marrese pointed to the group’s eclectic background – his in journalism, Hough Frame’s in mathematics and Berglund’s in psychology – as being truly dynamic when paired with the MBA degree.